Read the following instructions before uploading your photos OR Click Here to Download the PDF of these instructions. Photo should include entire area from the neck to the waist. 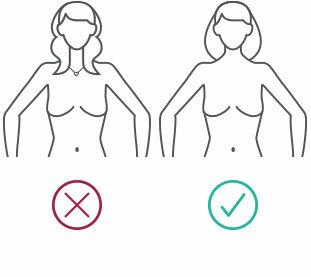 Hair should be tied back and jewelry (earrings, necklaces, piercings) removed beforehand. Background should be Homogenous, ideally blue. For profile pictures, position yourself at a 90º angle from the camera, keeping your head straight and looking forward. Hang arms by your side with your hands approximately 12 inches away from your body. Posture (arms & body) should be identical in all 3 photos. For best results, take photos in a bright environment, ideally with natural light, although artificial light is OK. 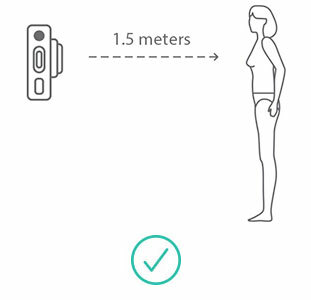 Camera should be held perpendicular to the body. Camera should be approximately 5 feet away from body. If light is poor, use the camera’s flash. Photos should be in colour and JPG Format. Any type of camera can be used, including smartphone, ipad, digital camera, etc. Photos should be taken in portrait orientation and not landscape.